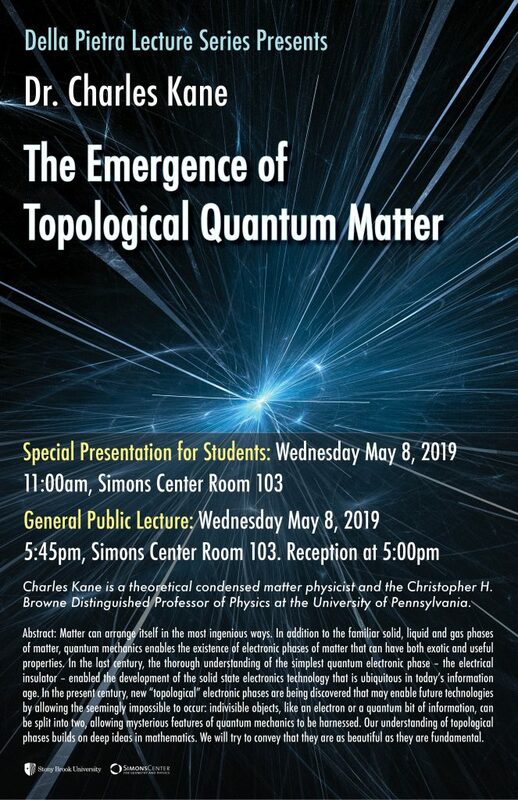 The Della Pietra Lecture Series is pleased to present Dr. Charles Kane, theoretical condensed matter physicist and Christopher H. Browne Distinguished Professor of Physics at the University of Pennsylvania. Abstract: Matter can arrange itself in the most ingenious ways. In addition to the familiar solid, liquid and gas phases of matter, quantum mechanics enables the existence of electronic phases of matter that can have both exotic and useful properties. In the last century, the thorough understanding of the simplest quantum electronic phase – the electrical insulator – enabled the development of the solid state electronics technology that is ubiquitous in today’s information age. In the present century, new “topological” electronic phases are being discovered that may enable future technologies by allowing the seemingly impossible to occur: indivisible objects, like an electron or a quantum bit of information, can be split into two, allowing mysterious features of quantum mechanics to be harnessed. Our understanding of topological phases builds on deep ideas in mathematics. We will try to convey that they are as beautiful as they are fundamental. Dr. Kane will deliver a third technical lecture for faculty and advanced graduate students as part of the SCGP Weekly Colloquium on Tuesday May 7 at 1:00pm. All of these lectures have been made possible by a generous donation from the Della Pietra family. 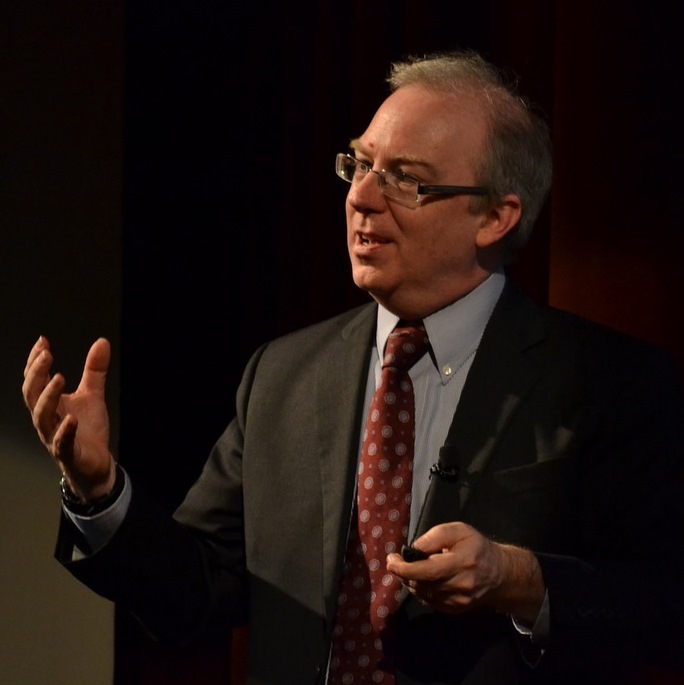 The Della Pietra Lecture Series aims to bring world-renowned scientists to the Simons Center for Geometry and Physics to enhance the intellectual activity of the Center and also bring greater awareness of recent and impactful discoveries in Physics and Mathematics to the Long Island community. For more information visit our website or call 631-632-2800. My research is focused on the theory of quantum electronic phenomena in solids. This is an exciting branch of physics because the technology for manipulating and controlling matter on a microscopic scale continues to advance in fascinating directions. The combination of molecular beam epitaxy and lithographic techniques allows semiconductor structures to be fabricated with dimensions measured in nanometers and with such purity that electrons travel microns before scattering. Such structures can effectively confine electrons to one dimensional “quantum wires” and zero dimensional “quantum dots”. At the same time, advances in “bottom up” technology have increased control over the self assembly of matter on the atomic scale. For example, since the mid 1990’s it has been possible to controllably synthesize carbon nanotubes, which are essentially perfect molecular quantum wires. More recently, it has become possible to individual planes of graphene, which is a two dimensional structure that is a single atom thick and has fascinating electronic properties. These techniques open the door to a wide variety of materials and structures which may be important for technological innovation. They also point to a number of issues in fundamental physics. In structures of reduced dimensionality, the collective behavior of electrons is strongly influenced by quantum interference, electron-electron interactions and disorder. These theoretical issues are at the forefront of modern quantum many-body physics and form the core of my research program. My expertise combines the fields of mesoscopic physics, the study of semiconductor nanostructures and strongly correlated electron systems. My approach is often to build simple models of materials which capture robust features that transcend sample specific details. Such effective theories allow the powerful techniques of quantum field theory and statistical mechanics and numerical simulation to be applied to characterize new phases, describe critical behavior and uncover topological order. My work is usually inspired by experiments – either to explain existing data or to propose experimental methods for probing new physics. I see myself as a translator between the deep and mathematically intensive theories of quantum condensed matter and experimental phenomenology. Specific problems which I have been interested in recently include theories of one dimensional conductors, the fractional quantum Hall effect, carbon nanotubes, graphene, the quantum spin Hall effect, topological insulators, and topological quantum computing.